India came to England with a lot of promise but fell short on the occasions which mattered the most. On the other hand, English players stepped up to cease the moments for their team and as a result, the home team won the series 4-1, that too in a convincing manner. In Cook's farewell Test, the English team continued their good work from the previous Test. Centuries from Alastair Cook and Joe Root helped England set a target of 464 against India. For India, KL Rahul and Rishabh Pant scored centuries but lacked support from others as only Ajinkya Rahane and Ravindra Jadeja made it to the double figures with 37 and 13 respectively. Six batsmen got out for single-digit scores, including four ducks and as a result, India lost the final test by 118 runs. A teary-eyed James Anderson spoke after England's victory. "Happy to see that Cookie was on the field to see that wicket. I am happy to win the game. When they were building a partnership, I think it looked that they will get close. My job was to hold an end. I was going through good rhythm and thankfully Joe let me take the new ball. And eventually, it gave me half-a-chance to get that wicket. On Cook, yes, he is my best mate and I am going to miss him. He has been brilliant and has been there for me all the time." "It has been the most amazing week. Got a text from Beefy (Ian Botham) and he said Can I have your scriptwriter? The memories shared with my team. Some very good moments. Today it showed how tough Test cricket can be. I leave with great memories. To see Jimmy go past Glenn McGrath was brilliant. Just has been a privilege to have played with England's greatest cricketer. No disrespect to any other cricketer. He almost takes it for granted that he will hit the length from ball one. It is fitting that he got the last wicket. You miss all the highs. I would miss playing for this team. This week can't be beaten. I can walk away with my head held high." "It is just nice to be involved in such a historic series. To win the series and send off Cookie, it is phenomenal. Playing with the likes of Broady, Jimmy and Stokes, It has been a good learning curve. I think consistency is the main thing. Don't look too far ahead. Hopefully, I can keep contributing. Missing out on the second game and then coming back to contribute was a great thing for me." "I think a lot of credit has to go to the two young guys. The kind of cricket we have played might not show on the scorecard. But both the teams know this series has been a competitive one. This has been a great advert for Test cricket. The basic idea was to go out there and play the cricket we are supposed to do. England are a professional side and we realized that as the game changed within two-three overs. Pant showed a lot of grit and character. We have character in the team and we just need some experience. When you get into a zone when you are not thinking about the result, things go your way. I am delighted for both the guys and it speaks of India's future. We did not take out opportunities. England also don't go for draws and they played fearless cricket and so did we. That is why you won't see draws in these kinds of series. We can take a lot of heart from this but apply ourselves better the next time around. There is a reason why we voted for Sam to be the Man of the series. It takes the character to come in and play like that. He put England forward in the 1st and 4th Test match. There should be exciting pitches all over the result. The fans will come and watch if both teams play for a win. Just one word for Cook. You have had a great career. All the best for all your future endeavors." "It has been a very tough series. India have played some exceptional cricket. Everyone watching would have been thrilled as well. India batted really well to get into that position in the final session. I mean Alastair has been such an exceptional player for a long time. He has been a huge part of our dressing room. Jimmy has a lot left I am sure. To achieve what he has is unbelievable. Hopefully, he can continue for many more years. We are growing all the time. Some young guys have stood up and performed. We have a lot of learning to do." There is no room for "what if" in sport. India had their moments but the scorecards say 4-1 and India weren't as good as they should have been. This is two overseas disappointments in a row now. Virat Kohli was at his very best, the fast bowlers were outstanding but there were too many loopholes in the batting to be able to deliver consistent performances. It was an excellent last day to a series that, on various occasions had us enthralled. It was good for test cricket. It will be a case of what could have been for India. Few positives on the tour but we lacked in consistency and have a fair bit of work to do to become a good travelling team. Congratulations to England on the win. 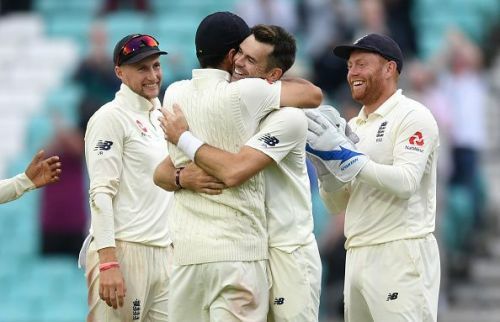 Cook’s stellar farewell 💯 @jimmy9 #564 Test wickets @RishabPant777 maiden test 💯@klrahul11 showing his class@root66 return to form 💯@MdShami11 Unluckiest bowler alive. Curran is England’s man of the series deservedly young Sam Curran. And to think he was dropped for a Test! I don't care what the result is any more. Thank you Rahul and Rishab for allowing us to dream and hope and just feel good about our team! Last time India won an away Test match while batting second was in August 2010 when they defeated Sri Lanka by five wickets during a 257-run chase. Anderson's record-breaking wicket gives him 24 for the series, average 18. In the last 3 English summers, he's taken 102 wickets at 15.8 in 20 Tests. India have found answers but have the same questions staring at them. Tactics, selections, batting, let down by many things. This was probably their best chance to win in England! Hopefully, right lessons learnt. Good luck. Some thoughts on James Anderson, the fast-bowler who now has the most Test wickets ever.